NIS America celebrates the 20th Anniversary of the classic CCG with the release of Culdcept Revolt coming to the Nintendo 3DS later this Summer. The news comes from the same press event where NIS America revealed the release date for Disgaea 5 Complete. Culdcept Revolt puts you in the shoes of Allen, a new recruit for the Free Bat forces. The Free Bats are a rebel army who hope to free themselves from the evil Count Kraniss. Culdcept Revolt has you build a deck of cards and play on a virtual game board full of traps, monsters, and soldiers. Fans of the classic Culdcept games should feel right at home, with the 400 plus cards providing a good number of strategies. Addictive Fantasy Gameplay – Jump into a match and lose yourself in a world of monsters, magic, and strategy as you navigate the board and summon monsters on your way to victory in this fast-paced, card-collecting fantasy! Near-Endless Strategy – Collect over 400 unique cards and develop your skills as you test your deck on new boards with new conditions, or return to favorites to hone your strategies. Customize Your Experience – Make your gaming personal by developing a deck to fit your gameplay style, and choose the perfect avatar and deck to represent your play style and personality! 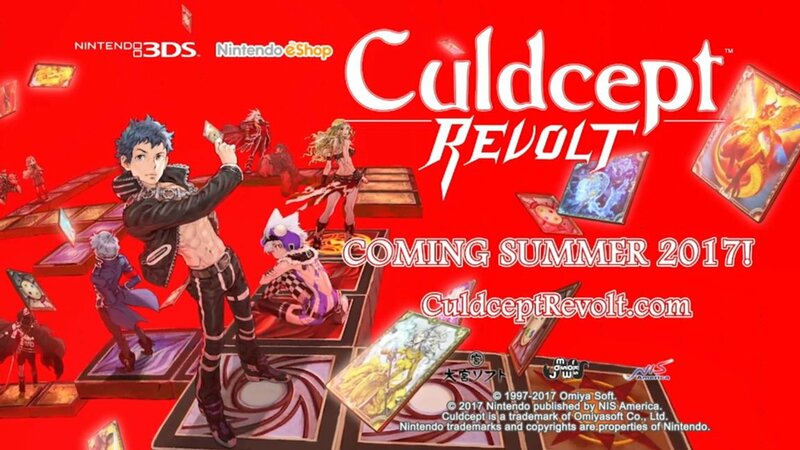 Expect to see Culdcept Revolt this Summer on Nintendo 3DS. SNK HEROINES Tag Team Frenzy Interview – 2v2 Tag Battles, 60 FPS On All Platforms, And More.